Yoga helps women feel more comfortable in their body and can ease the stress of birth and postpartum discomfort. One of my great joys is watching pregnant women emerge into motherhood as they go through my Prenatal Yoga and on to Mom + Baby Yoga classes. When I was asked to teach Ma Yoga Living’s online course for instructors and practitioners, The Yoga of Birth, it brought it all together for me. There are so many fears and concerns for most women as they make this transition. Giving birth is a scary unknown despite the fact that it happens to women around the world every day! Thankfully, there are helpful childbirth and parenting classes, books, and videos to help new parents navigate these uncharted waters. But childbirth preparation is not just about gathering obstetric information; it is also about self-discovery. The contemplative environment of a yoga class can help to nurture this awareness further. It allows them to tap into a more profound wisdom already residing within and to sift through all the information they are gathering to find what is right for them. This is what I love most about yoga for pregnancy, birth and beyond. How does yoga create this contemplative environment? Physically, yoga poses strike a delicate balance of strength and flexibility. The poses are chosen to create space and comfort for a growing baby and mama. A mother’s growing body and hormones tend to cause aches and pains throughout pregnancy. The importance of an alignment-based yoga class is to reposition the mother and baby for optimal energy flow. By using endurance practices that challenge the mom, she begins to experience her body as strong and capable. The poses taught in class are also useful during labor to ease pain and reposition the baby if needed. Mentally, yoga breathing teaches mothers to relax – a vital technique for labor and birth. Quiet mindfulness and reflection are rare and needed when change is constant. When a mother can retreat to a peaceful place in her mind, she can better manage the challenges that are in front of her. Challenges can include a prolonged labor, the intense sensations of contractions, or an unexpected turn of events. Additionally, consistent yoga practice can cultivate discernment, awareness, self-regulation and higher consciousness, all incredible functions of the mind to create positive change in how we view pregnancy, birth, and motherhood. Spiritually, yoga welcomes the wonder and mystery of pregnancy and birth. 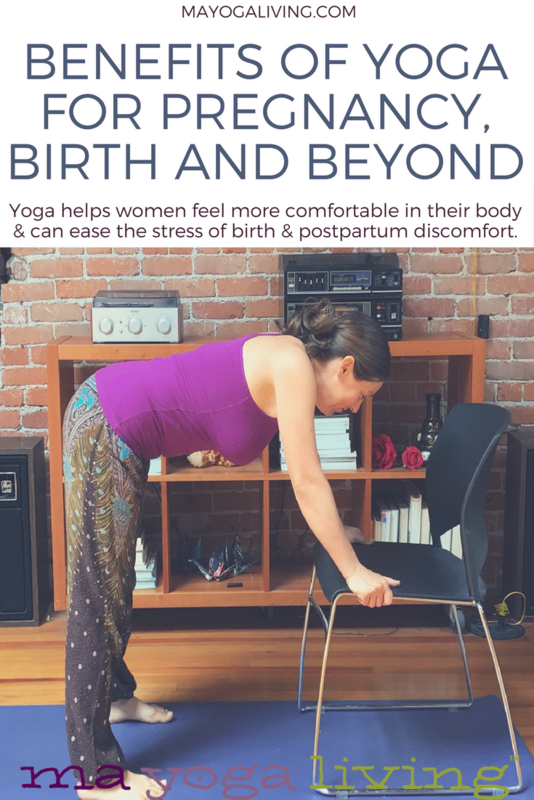 Yoga can help a mother-to-be connect to the unique individual growing inside, teaching her to be the best version of herself. And it can help her connect to the universal consciousness that is a more significant force working alongside her, teaching her to surrender to the flow of the Divine. The lucky thing is that you don’t need a daily hour-long practice. A few poses a day, with a little guidance can make all the difference! For physically, mentally, and spiritually transformative online yoga for pregnancy, plus education and support, join Lauren and other Ma Yoga Mamas at www.MaYogaLiving.com. I discovered yoga in 2003 with the intention to relieve chronic low back pain and it worked! Since then I have experienced the benefits of yoga at all stages of life; as a single woman, in marriage, during pregnancy, and now as a mother. My passion is empowering mothers as they prepare for birth. As a lead prenatal yoga teacher trainer for Ma Yoga, I am honored to guide budding teachers on a journey of changing lives one breath at a time, by traveling to studios as well as teaching The Yoga of Birth online.